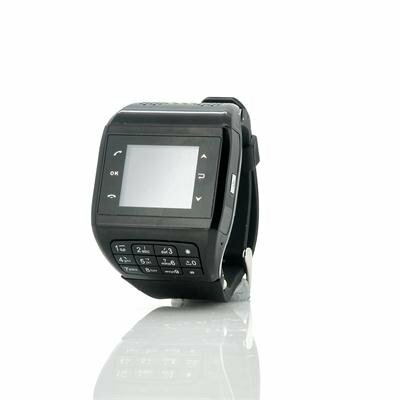 Successfully Added Mobile Phone Watch "Panther" - Quad Band GSM, Touchscreen, Keypad to your Shopping Cart. 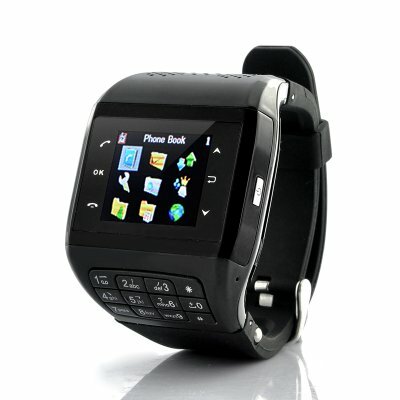 Mobile Phone Watch with touch screen and keypad is here to help make your life easier. Wear it on your wrist to instantly make phone calls and easily send text messages with the built-in keypad. The “Panther” watch phone comes with plenty of features to make your mobile communications easy, such as worldwide quad band GSM connectivity, a colorful 1.3 inch touch screen to navigate, Bluetooth support with included ear set, and much more. A 2GB micro SD card is also included for you to load up songs and videos for playback directly on your watch phone. When it comes to ease of use the “Panther” is king. Coming with a built in keypad that makes dialing and answering phone calls easier than ever and a handy touch screen for smooth operation. The buttons are nicely spaced and easy to press, yet they blend in well and add to the overall design of the “Panther”. The touch screen is also extremely easy to navigate and can be controlled even without the use of the built in stylus. If a practical and easy to use watch phone is what you're after, then the Panther is sure to satisfy. With the built in mp3/mp4 media player you can easily playback all of your favorite movies, music or pictures, all with just a quick tap of the touch screen. Plug this watch phone into your computer’s USB port and load your favorite media files onto the micro SD card. The audio can then be played through the included Bluetooth earpiece set, directly through the built in speakers, or through a set of wired earphones. And to top it off, this model even comes with a discreet pinhole camera lens just in case you need to do a little detective work on the side! The “Panther” supports all worldwide GSM frequencies so you can use this watch phone anywhere in the world and remain confident that it will always work. Additional features include a calendar, to do list, text document reader, WAP internet, alarm clock, sound recorder, and much more! This watch phone really has it all. Order one today or buy some in bulk for the perfect eBay resell item. The “Panther” is in stock now and ready for immediate shipment. Available only from the leaders in high quality wholesale watch phones and wholesale electronics, Chinavasion! I have it for 2 years and was NEVER able to get its earpiece / Bluetooth working or connected. Not very clear instructions, you have to guess lot of functions... Does NOT provide name or contact for manufacturer in case you need help. 1. Please charge the bluetooth headset fully. 2. In turned off state press and hold the main button for about 8 seconds until it goes to pairing mode (blue - red light flashing). 3. Go to bluetooth settings on the cellphone, enable the bluetooth and select Inquiry Audio Device option. 4. When the new bluetooth device shows up, select it and enter the default pairing code 0000. You can contact anytime support@chinavasion.com with your order number and item code so that our technicians can help. I love it and love all the features on the phone works great! sound is amazingly clear!! Bluetooth pairing is in the organizer folder icon on the main menu and not under settings like in some phones! on 2013-05-04 06:05:53 All the power of a phone in your wrist!!! All the power of a regular cell phone in your wrist!